Holds standard three to six gallon bottles (not included). Child safety guard on hot water valve. 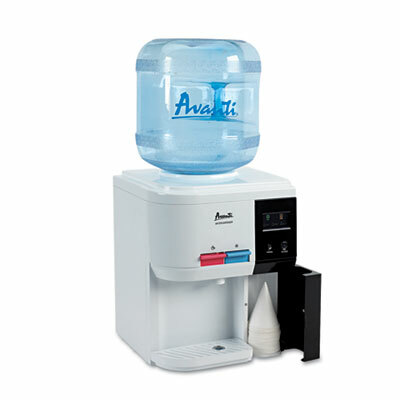 Includes removable drip tray and built-in cup storage compartment. Convenient drain plugs for hot and cold water reservoirs. Separate on/off power switches for hot and cold water operations. Select operation modes--normal or energy saver. Holds standard three to six gallon bottles (water bottles not included). Push button faucets for cold and hot water. Child safety guard on hot water valve. Includes removable drip tray and built-in cup storage compartment. Compact solution for home or office use. Includes convenient drain plugs for hot and cold water reservoirs. Separate on/off power switches for hot and cold water operations.